Surprisingly, to a few people, my garden has done quite well on top of our “windy” hill. My Roma tomato plants are still producing and are loaded with tomatoes. I’m hoping to can all of those when the time comes. My jalapeno plants have been doing really well also and boy are they H-O-T ones! I had three dozen the other day and knew that I wanted to stuff them with something and then bake them in the oven. Kevin had some friends over, so I decided that the guys might like them as appetizers. I started by grabbing a sharp paring knife and also my grapefruit knife (it’s the one on the left). 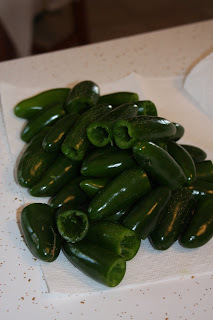 I lopped off the tops of the jalapenos. Now the ground chorizo that I used I actually made a while ago and then froze the leftovers. But you can make it fresh. All I did was saute some green pepper and onion and then brown the chorizo and mix them together. Once the chorizo mixture is cooked, add some to the cream cheese mixture. Mix well! Then add some cheddar cheese. There are no amounts on this recipe because it all depends on how many jalapenos you are stuffing! So just eyeball it until it looks tastes right! After you have it all mixed together, you need to stuff the jalapenos. To do this I used a small spoon to squish the cheese mixture down into the pepper. Fill it all the way to the top of the pepper and then place them off to the side. Now the next picture looks a little funny, but it was the only way that I could get the peppers to stay upright in the oven! I didn’t want to lay them down because all the yummy filling would have oozed out. 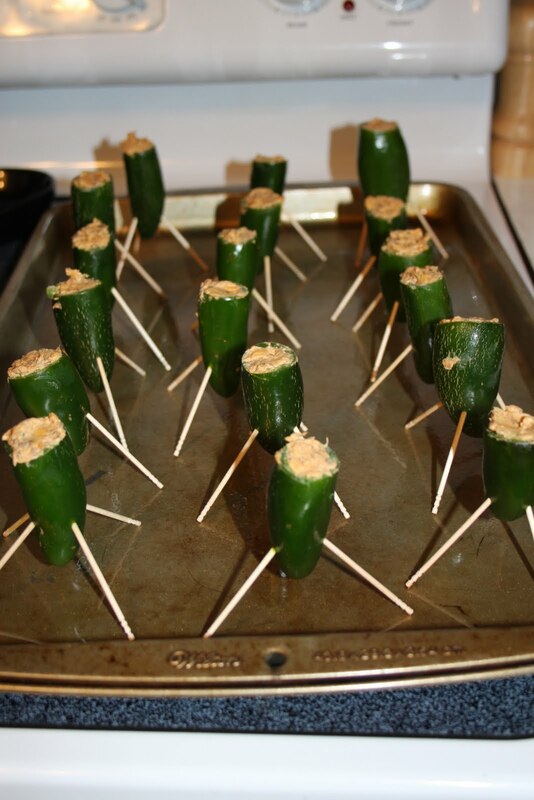 So I inserted 3-4 toothpicks into each jalapeno pepper to make them stand up on a cookie sheet. Place them in the oven at 350 degrees for about 15-20 minutes. Serve them with a side of sour cream to help cool your mouth off! (I sprinkled a little garlic salt and Lawry’s into the sour cream). Enjoy! 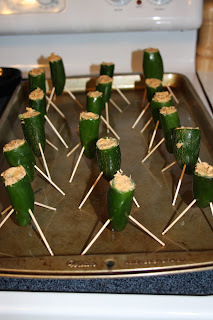 These make a great appetizer for a large group of friends and family, just make sure you warn them if they are HOT! « Wordless Wednesday-S’mores with Grandpa! I’ve made similar poppers sliced in half, stuffed, then wrapped in bacon … Yuuummy.